"Thank you for making our day stress free!" "We absolutely loved your magic! Bloody brilliant!" "He was hugely entertaining, with a real sense of mischievous fun!" Pepsi, Unilever, AstraZeneca, The Daily Mail, SKY TV, Redrow Homes and many more, so you know you’re in safe hands. I’ll get your guests laughing and having a fabulous time, so that you can sit back, relax and enjoy your special day. Part magician, part comedian, mostly hungry. 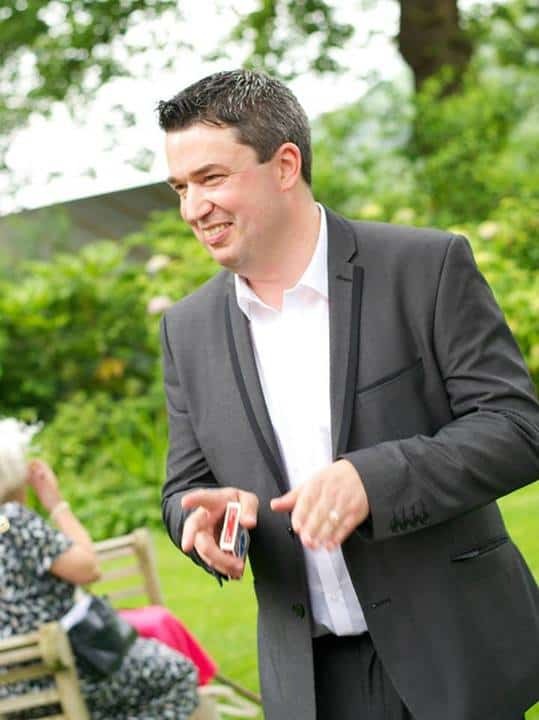 John has been a full time magician for the past 8 years (one of the very few in the UK). Aside from being able to do magic, he’s also an award winning comedian who prides himself on being able to get your guests laughing, as well as amazing them with sleight of hand. He spends his time travelling the UK performing at corporate events, weddings and private parties, for clients who want to take the stress and hassle out of their event. Aside from that, he has a wife, two kids and a very small dog. He enjoys drinking large amounts of Diet Coke and eating larger amounts of Tunnocks Teacakes. He also hates writing in the third person.